I'm currently in Cape Town, South Africa, and I wanted to catch up on some things from last week. When I encountered the semi-tame hyena and elephants in a special facility, there was also another animal that I encountered: a five hundred pound lion. Note that I am holding a short stick. This was to fend him off in case he attacked me. Seriously. As the animal handler told me, there's no such thing as a tame lion. My own idea, based on a famous statement by Reuven Schmeltzer, is "I'm a shaliach from Rav Moshe Shapiro, being lochem milchemes Hashem!" But perhaps you can come up with something funnier. "mmmm - -apikores al ha-aish!" "Yea I'd love to, but I heard he lost his hechsher". 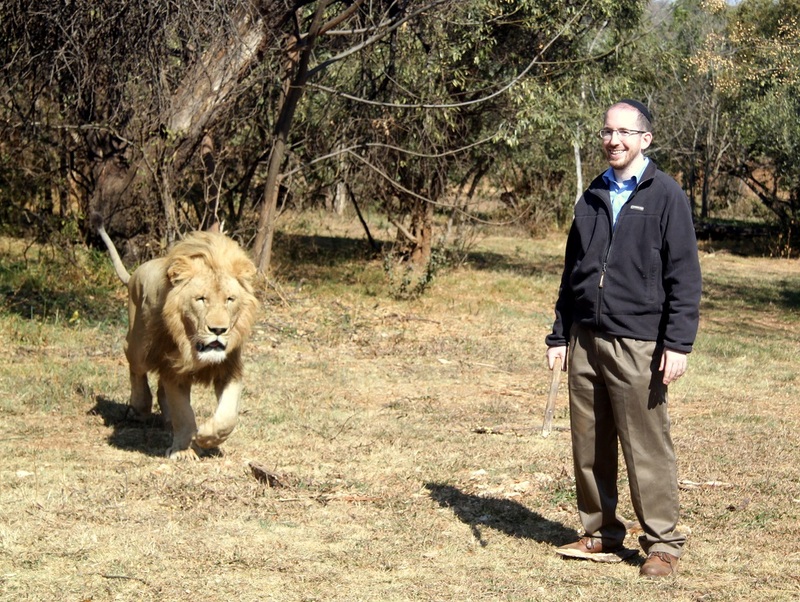 Lion: "Shalom rabbi Slifkin. I'm the cowardly lion. I was told you were full of wisdom. But if you please, it's courage that I need." pretty good. hard to beat. Hmmm, wash for bread or just make a shehekol? "Baruch atah Hashem ... shehakol niyheh bidvaro!" Looks delicious, but the mashgiach said he's treif. "Hmmm; a little on the scrawny side, but comes with a toothpick." "R' Slifkin shall go out as a mighty man, he shall arouse zeal, he shall cry, even roar; he shall prevail over his enemies." This reminds me of a joke about two Jews, Chaim and Yankel who were out camping in the jungle. 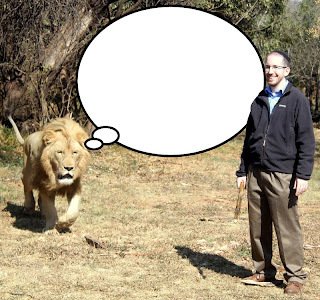 Chaim notices a lion approaching from a distance and alerts his friend telling him we'd better get out of here fast! Yankel takes out his backpack, gets out his running shoes and proceeds to start putting them on. Chaim looks at him like his crazy and asks, Yankel, do you really think you'll be able to outrun that lion?? Yankel responds, I don't need to outrun the lion. All I have to do is run faster than you! "Mr. Slifkin, is it? Yes, I read your 'Kollel Guys vs. Lions' post about how the lionesses do all the hunting, and we males are a bunch of lazy bums. Fascinating! How about you and I do a little field work to test that hypothesis?" No heksher from the Badatz? Forget it. Or maybe this time, I'll make an exception and be someich on the rabbinate. What exactly does he think he's going to do with that small stick? Yes! Rational Jews taste much better than Chareidim! now seriously who do you really think has a cooler beard??? Are you the one who's been spreading rumors that male lions don't kill their own prey??? So youre preparing for Goliath with your sticks. 'gam es h'ari' etc. "I know this approach seems extreme, but hey, whatever it takes to remind him of the existence of the Frum Kiruv Mane-iac." Don't worry. According to the Maharal I'm just an allegory! I heard you needed pshat in Nachum 2:13. Here I am. Rats, I wish I hadn't just had that cheddar cheese! "That locust was my BROTHER!" "The lion will lie down with the... Lamb? No. Kid? No. Wallaby? Ah, forget it, I'm hungry!" Sorry to break up the banter of the various comments here, but: if lions aren't really ever tame, how do they manage to "tame" a circus lion to allow the trainer to put his head inside the lion's mouth? What keeps the lion from just attacking the circus performers? "Hah! Va'asa chutra, v'heeka l'chalba, d'noshach l'shunra..." Wait 'til he finds out that the I'm the 'shunra's' cousin! Chad Gadya! Chad Gadya!" I told the shadchan that I am a k'fir (young lion) looking for a k'firah, but this is not what I had in mind!! "He is lucky that I am shomer shobbat!" Sighing deeply...why can't I ever get a nice salad? Is he a kezayis, or do I need to eat two of them to make a beracha achrona? Is he really traifoh to be also suitable for a lion? Or only traifoh enough for a dog's dinner. "I told the shadchan that I am a k'fir (young lion) looking for a k'firah, but this is not what I had in mind!!" It so happens that I know a (religious Jewish) woman named Kefirah. Named after the lion, of course. Is he really 500lbs? He doesn't look a pound over 499.